This isn’t my typical report because it wasn’t a typical evening – no notebook and pen for me tonight. Just my lungs, and great company. Jake Nicholson (20) for Nabil Bentaleb, 67. Laste Dombaxe (17) for Giancarlo Gallifuoco, 80. Just two months ago, we beat Arsenal 4-2 at Hotspur Way. Interestingly, our side tonight featured just four of the same players in the starting eleven – due to injury, loan, etc. A game of two halves. Spurs dominated in the first half, with Bentaleb and Carroll dictating things in the middle – their quick one and two touch passing proving fruitful. They were given useful protection from the physically strong Gallifuoco, which allowed them extra freedom. Both wingers looked genuinely threatening, switching sides with regularity and troubling both Meade and Jenkinson, the Arsenal full backs. Ceballos and Coulthirst missed terrific chances to put us ahead after good approach play. A two or three goal lead at half time would not have flattered us. Spurs took the lead at the very start of the second half, with McEvoy getting the better of Jenkinson and providing a cross for Bentaleb to open the scoring. I expected us to go on and win comfortably. From there, however, Arsenal took a foothold and largely dominated. Spurs were incredibly resilient, with Hall putting in a fine display, and Fryers having a solid game at centre back (which is not his favoured position), but Arsenal were wasteful in front of goal. In truth, it could have been 3-3. It wasn’t all Arsenal, though – Coulthirst hit a vicious half-volley which was well saved, and then hit the post with a curling effort, and Ceballos missed a fantastic chance from within the 6 yard box after yet more good play from McEvoy. NB: It was nice to see Jake Nicholson return after 15 months out – he came on for Bentaleb and looked composed in the middle of midfield. I’ve seen some bizarre criticisms of 1882, and what it is trying to achieve – it is accused of trying to segregate/differentiate groups of fans or of thinking too highly of itself – that’s nonsense. It’s about having fun. It’s about fans taking ownership of football matches, and getting the maximum from supporting their team. It is an antidote to the sense of entitlement that we’ve seen at White Hart Lane and football in general. 1882 is all the fun parts of tribalism – the loyalty, the unrelenting support regardless of what is happening on the pitch, and the feeling of being a part of something. Several hundred people all wanting the same thing. A fabulous variety of songs, full-on singing for 90 minutes, light-hearted banter with the home crowd, and a happy-go-lucky outlook that just isn’t seen regularly at Premier League games. Worth noting that the players loved it – they all came over to us at the end to show their appreciation – some were dancing and singing, and all were applauding us, as we were them. A fantastic time had by all. 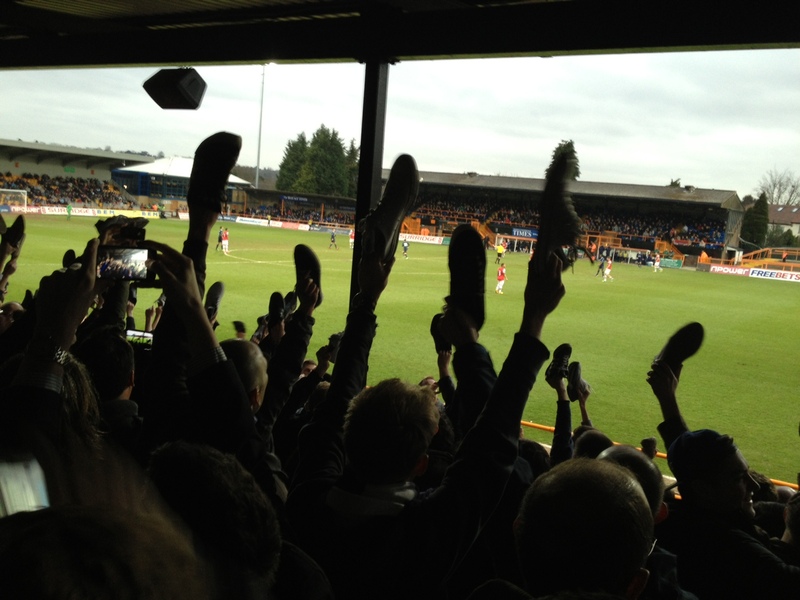 Shoes off if you love Tottenham. Nicely put Windy, it was a fantastic fan experience. Beating & out-singing arsenal on their own patch and seeing a good performance from our youth team. Thought Tom Carroll stood out head and shoulders above the rest but Kenneth McEvoy had a good game too. Grant Hall looks like a prospect, must admit hadn't heard of him before tonight. Grant Hall was signed from Brighton. He was playing in the Brighton first team under Poyet. Cheers Nick! Totally agree about Carroll, best player on the pitch by a distance. Thought McEvoy, Bentaleb and Hall were our next best, and Coulthirst kept plugging away too. Good to see you! Best #1882thfc game I've attended to date. Fantastic singing, great laugh, tidy football, nice result! COYS!! Was a lot of fun wasn't it?! It was a fantastic evening, entertainment on and off the pitch. Singing songs and going home happy, that's the football I remember from decades ago. Although I was fairly sure we were 2-0 up by half time and it finished 4-0, but then a win is a win, especially against the south london wanderers. Ha, good point! 4-0 it is! Fantastic write up Windy - although there is a typo (seventh from last word *them). Cheers eagle-eye - sorted! Good to see you again, mate. Great read; thanks for posting Windy!